A dispute between two German YouTubers reportedly incited a public brawl between their respective fans on Thursday. Bahar Al Amood a Berlin YouTuber with 14,000 subscribers and ThatsBekir a Stuttgart YouTuber with 263,000 have been beefing on social media, according to German newspaper Berliner Morgenpost. But they decided to take the fight offline recently and reportedly told their fans to join them for a meet-up at the Alexanderplatz public square in Berlin on Thursday at 5 PM. 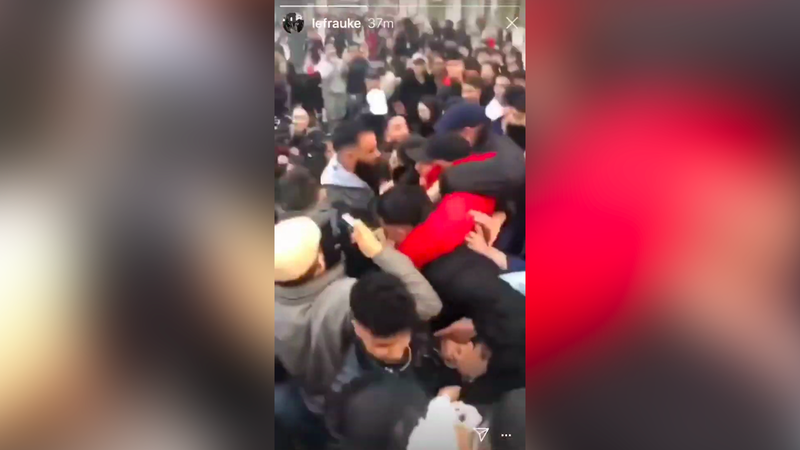 According to Berlin police, about 400 people arrived in support of Bahar Al Amood or ThatsBekir, and a fight erupted between about 50 of the fans. A video of the event that has been spread on YouTube shows two men talking right before a fight breaks out. Reports suggest those men are Bahar Al Amood and ThatsBekir. Agence France-Presse reports that 100 officers arrived at the scene to break up the fight. The police reportedly used tear gas on the crowd and arrested nine people. Two officers were reportedly injured in the large altercation. Following the fight, Bahar Al Amood posted a video on Instagram in which he apologized and said he wouldn’t speak to media, according to AFP. ThatsBekir released a video statement on Friday blaming his rival. “Just such a vulture, for fame, because he has no subscribers. Just such a vulture,” ThatsBekir said, referring to Bahar Al Amood. The YouTuber’s channels are still live and YouTube did not immediately respond to a request for comment sent by Gizmodo. Though YouTube often finds itself dealing with complex moderation cases, calls to violence specifically violate its terms of service. “We see in the rapper scene, and increasingly also with other influencers, that they are sometimes very negligent with their influence,” said Norbert Cioma, head of the Berlin police union, according to AFP. “It seems to be fashionable to deliberately open a powder keg to generate more followers, subscribers, and clicks,” Cioma said.